34 days before the start of the 45th ADAC Zurich 24h race at the Nürburgring, the major dress rehearsal awaits ROWE RACING on Sunday (23rd April). 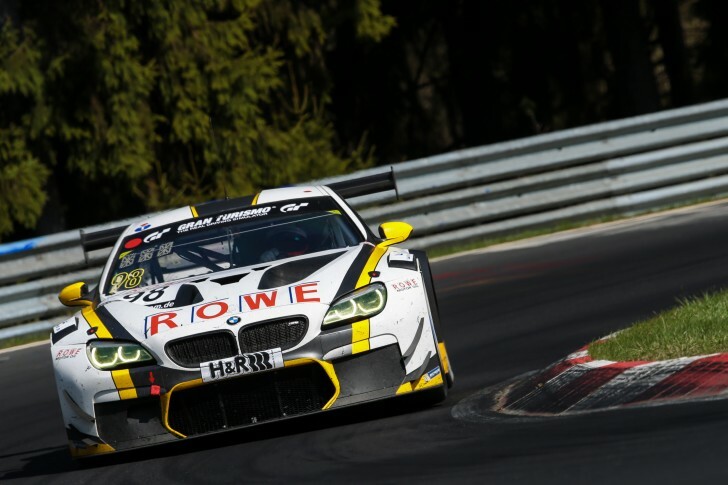 For the 24h qualification race, the team from St. Ingbert will be sending out the two BMW M6 GT3s to race around the legendary Nordschleife that will also be competing there in the highlight of the season on 27th/28th April. The winning trio from Spa will be sharing driving duties in the #99 BMW M6 GT3. Current BMW DTM driver Maxime Martin, from Belgium, and BMW works drivers Philipp Eng of Austria and Britain’s Alexander Sims triumphed in the Ardennes last year, having already done an outstanding job at the classic Nürburgring race to finish as “Best of the Rest” in fifth place. This team will be supported by ROWE RACING’s new driver, the German Nordschleife specialist Marc Basseng. The three drivers who competed in the “Eifel Marathon” together last year will also be sharing the cockpit of the team’s second car for the 24h qualification race. Britain’s Richard Westbrook will join Dutchman Nick Catsburg and Finnish driver Markus Palttala. Alexander Sims is listed as the fourth driver, meaning that he will compete twice. The 24h qualification race is the last opportunity for all participants to complete one final test under race conditions on the 25.378-kilometre long combination of Grand Prix circuit and Nordschleife. ROWE RACING is approaching the race as a real dress rehearsal, to discover whether all the improvements made during the winter break and after the first two VLN races are functioning as expected. It is also a valuable chance to gather more experience racing under new regulations and with new tyres. This means that the team from St. Ingbert has reluctantly decided to opt out of competing at the second race in the Blancpain GT Series, the endurance race on the historic Monza circuit in Italy, which will be taking place concurrently. The 24h qualification race at the Nürburgring is scheduled to start at 12:00 on Sunday 23rd April.